I consider myself a beginning quilter... I like to begin quilts but I can't seem to finish them. Last week was $5.00 sale table fabric... what will this week be? 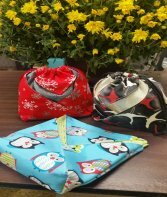 Like potato chips, I bet you can't make just one.These adorable fabric bags with a drawstring closure are simple and quick. With just a few fold and a few stitches you can assemble these quickly! Ask yourself what grandmother wouldn't want their grandchild's hand print on a potholder? Don't want to think about little hands on hot potholders, use another design. This quick make and take will walk you thru one style of applique, using your machine for quilting and adding binding on a project so small you will complete it in one night. Ready for Christmas.